from an ingenious portfolio on behance network comes this proposal for an elegant carafe utilizing two lip system to eliminate dripping. 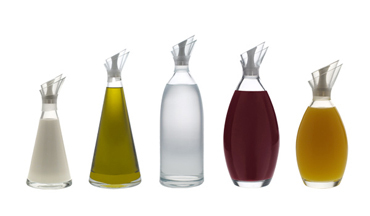 the noro no-drip employs a wonderfully creative system of two-lips that allows for the reacquisition of dripping liquid, thus eliminating sticky tables and carafes everywhere (below). as if the engineering behind the carafe wasn’t enough for me to want to see this product brought to market the bottle’s form is simply stunning (top). gentle curves and counter curves of clear glass come to life when filled with liquid. the two lip system at the top almost appears as a motion blur ghost of a lip. it’s a pure, simple, functional, design that does nothing more than improve the way we live. 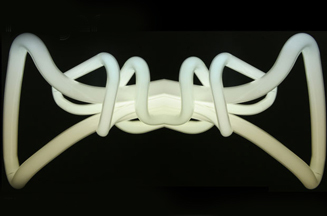 using the tublar form of the bulb’s fluorescent cavity to their advantage, the designers spun up some surely fantastic forms. 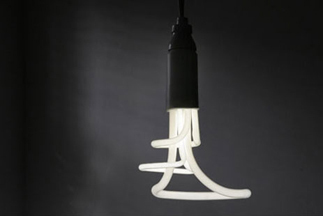 i find it fascinating to see the wide variety of forms the plumen folks came up with. after all, why does a light bulb have to be pure utility? can’t it too be activated by design? the folks working on the plumen project sure think so and i for one agree. these are fun (and at 2700 kelvin a nice warm cfl light), i certainly hope they find their way to the market. how cool is this? 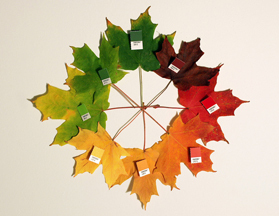 chris glass managed to take all of these leaves from the same tree and match them with their respective pantone colors. how creative and fun? 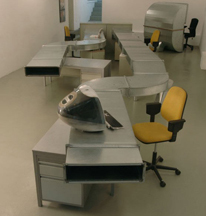 i found this idea at yanko design this afternoon. how smart! 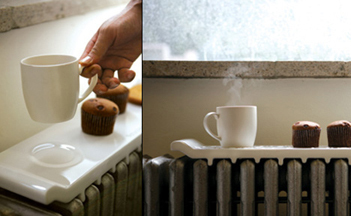 designed of simple ceramic and sized accordingly, you can use your outdated radiator to keep coffee and food warm without expending extra energy to heat it, passively warming the way we live. cool earth solar has found a way to dramatically reduce the construction cost of large scale solar projects. 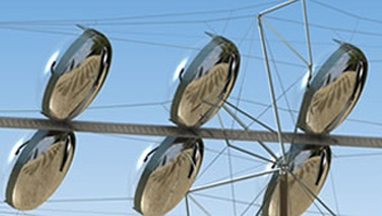 essentially they have created inflatable solar concentrators that are so light they can be suspended from a tensegrity (which is, in turn, an incredible light and efficient structure). the overall reduction in weight and the change of materials (from polished aluminum concentrators to inflatable ones) has reduced the amount of expensive heavy steel required for the project. in fact, cool earth solar claims that these large scale arrays will cost almost 400% less than the traditional aluminum collector versions. of course there is a catch; the catch is that the inflatable mirrors are far more breakable and much less efficient that the current models. so as it stands now, this process isn’t yet as cost effective as it sounds. nonetheless, if the efficiency and fragility issues can be worked out this design strategy could prove hugely effective. 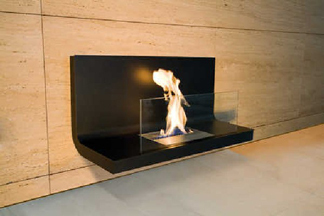 available in black or stainless steel, this sleek ultramodern fireplace burns bio-ethanol as fuel (don’t let the name fool you, it’s not really an environmentally responsible or viable alternative fuel, at least the american version). the fireplace is wall hung and requires no chimney, flue, logs, or smoke and is designed by radius. personally, i think this is a piece of gorgeous design and i would love to see it installed in person (preferably in my home). all of this just in time for winter. 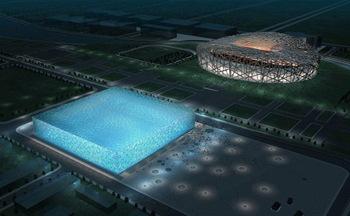 with the announcement this past saturday that chicago will be the usoc’s bid city for the international competition to host the 2016 games, i was reminded of a pair of projects under construction for the beijing games in 2008 that i cannot wait to see completed. 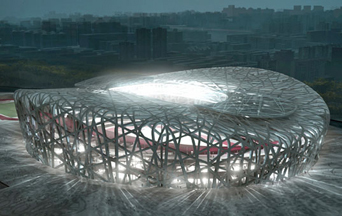 two of my favorite architects, jacques herzog and pierre de meuron, have prepared a breathtaking stadium to be home to the 2008 beijing olympic games (seen below). 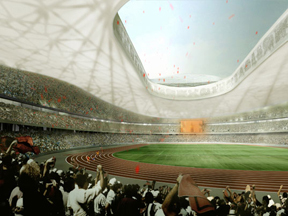 the stadium, which features an elegant and beautifully proportioned lattice exoskeleton, will, like so much of herzog and de meuron’s work, become a softly glowing beacon at the core of the games. 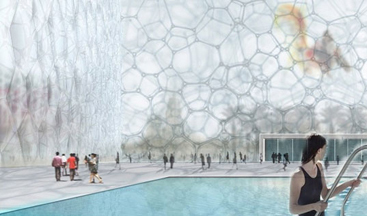 but the building i am most excited for is the national swim center, commonly known as the bubble-building for its organically-undulating, and otherwise other-worldly, bubble-like etfe skin (seen above). 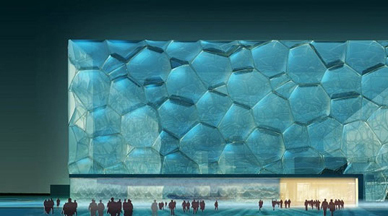 the soft diaphanous glowing quality of the backlit etfe gives an almost magically aura to the structure. truthfully, the material reminds me of the 3-form chroma we talked about a while back. if both of these buildings follow through on the ambiance presented in the interior renderings they will each present a stunning experience to the user (stadium just above, swim center just below). what’s even more interesting is that these two buildings, the stadium and the national swim center, are siting within a stone’s throw of one another, in constant, and very unique, dialogue (as seen in the first image at the top). additionally, herzog and de meuron were recently awarded the 2007 royal gold medal in architecture, they had previously received the 2001 pritzker prize. i can’t wait, bring on beijing 2008.
this is fascinating stuff. treehugger this morning is reporting on a story about a newly developed transparent cement; and, as if that prospect wasn’t exciting enough, the stuff is capable of conducting electricity like a metal. 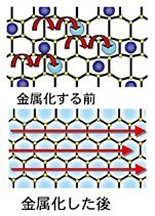 apparently, japanese researchers, “have altered the crystal structure of alumina cement and turned it into a thin, transparent membrane that conducts electricity.” i for one am excited by the possibilities of both transparent cement and electricity conducting cement; walls could potentially carry electrical currents leading to a variety of breakthroughs and advantageous designs, not to mention possibly saving on the cost and production of miles of wiring and electrical cables (the picture above illustrates the description below). how strangely bizarre and wonderfully creative. of course, similarly, we discussed the holy grail of concrete, litracon, a while back (note that concrete and cement are very different. cement is one of a number of ingredients used in concrete. concrete is the material of curbs, sidewalks, foundations, and many building cores and walls). nonetheless it will be interesting to see where this new cement takes us. architechnophilia, a wonderful blog we’ve mentioned before, had another great link the other day. superuse is a website that celebrates the unique and creative reuse and recycling of objects and products. i love the ingenuity presented on this site. 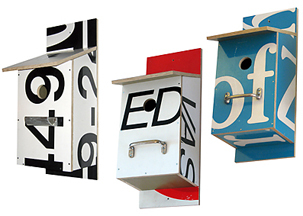 some of my favorite examples are the “billbirdhouse” (pictured above) in which road and street signs were reused in order to make brilliantly colored birdhouses and the “airconditioning” (pictured below) in which old air ducts were reclaimed in order to make an very interesting office desk. it isn’t just the fact that superuse documents recycling projects that makes it so great, it’s the fact that they celebrate the artistic ingenuity and creativity of reusing materials. head over and check it out. 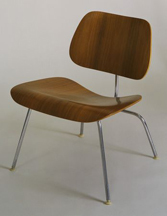 recently there’s been a link floating around for a phenomenal video that shows the delicate craft and assembly required in creating one of charles and ray eames’ famously beautiful lounge chairs. i’ll be the first to admit that this is probably my favorite piece of furniture ever designed. 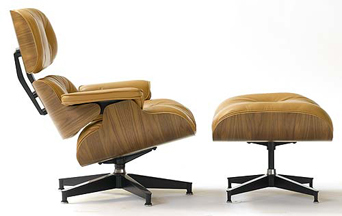 the eames’ were some of the most prolific furniture designers of their time and probably the fathers of modern ergonomics as seen in the lounge chairs and molded plywood chairs. their molded plywood chairs (as seen below) found themselves into almost ever american classroom in the form of one knock-off or another. the eames’ also produced wonderful short films, including the classic, and arguably the most famous short film ever, powers of ten, an exploration in how we view the universe as seen through the journey from the core of the atom to edge of the universe zooming out by powers of ten every second (there was actually a great simpson’s spoof of this in one opening credits scene). and in case you wanted to purchase a lounge chair, they can be bought at design within reach.